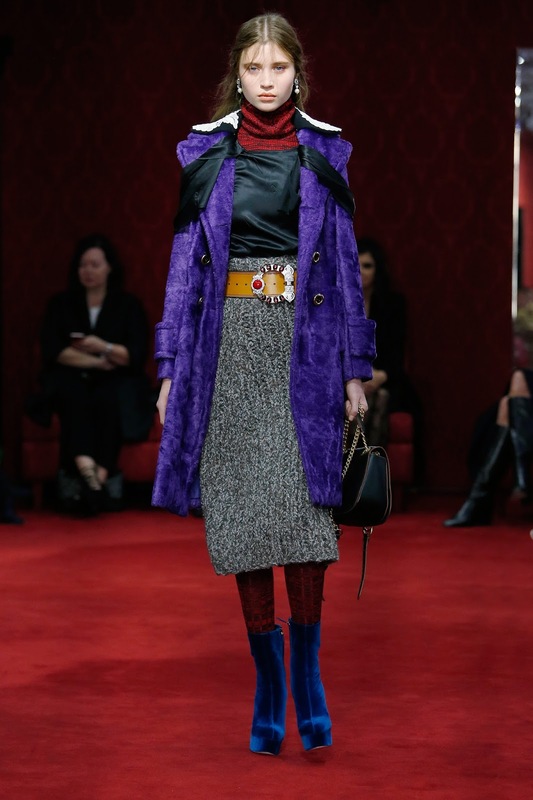 I love Miu Miu because I love that Miuccia Prada has fun with it. 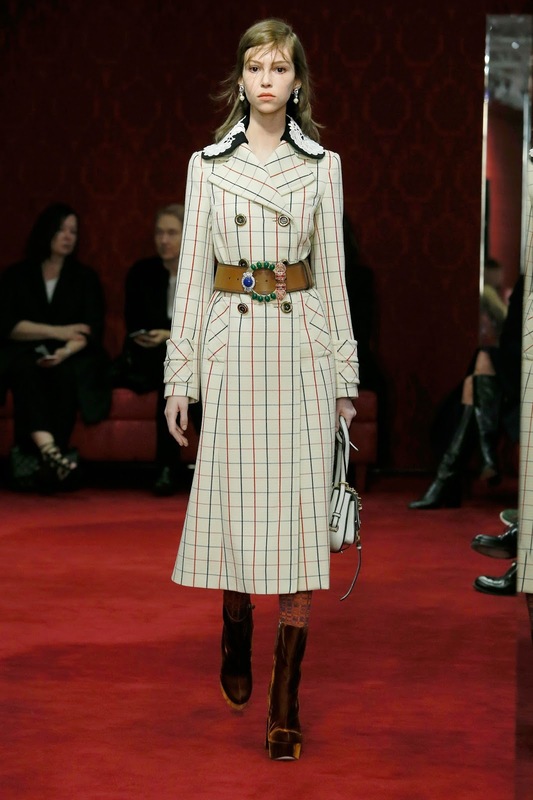 The similarities between Miu Miu and Prada are noticeable, but I feel that Miu Miu has that edge. The fun, flamboyant and eccentric edge. 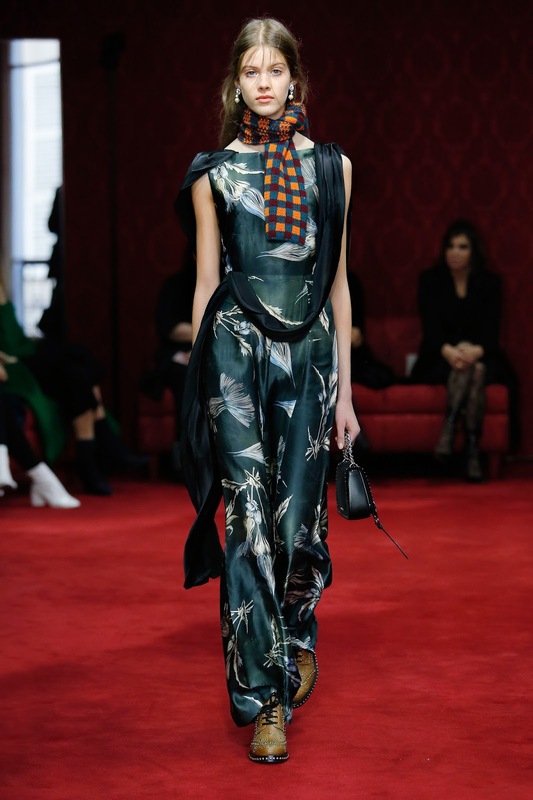 The show itself was fairly casual, being shown at a Paris store and the models gracing the carpet conveyed a relaxed and fun feel to reflect the collection perfectly. 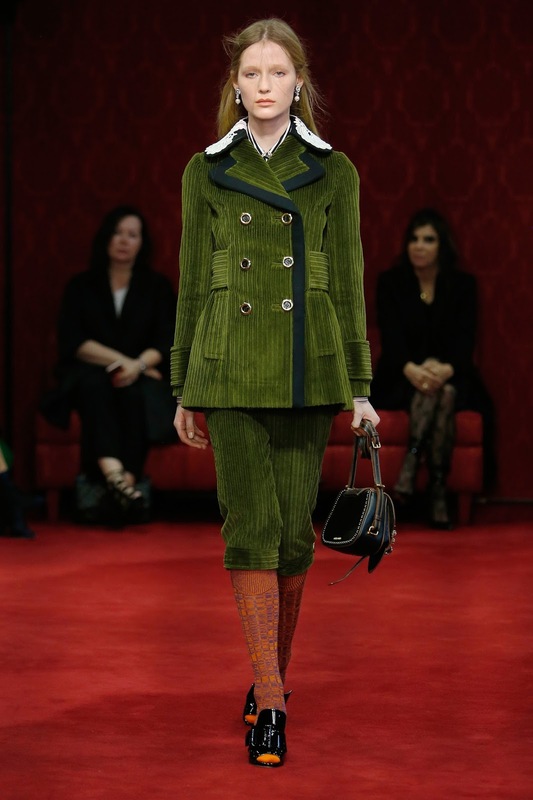 The collection gave us everything we wanted from Miu Miu this season. 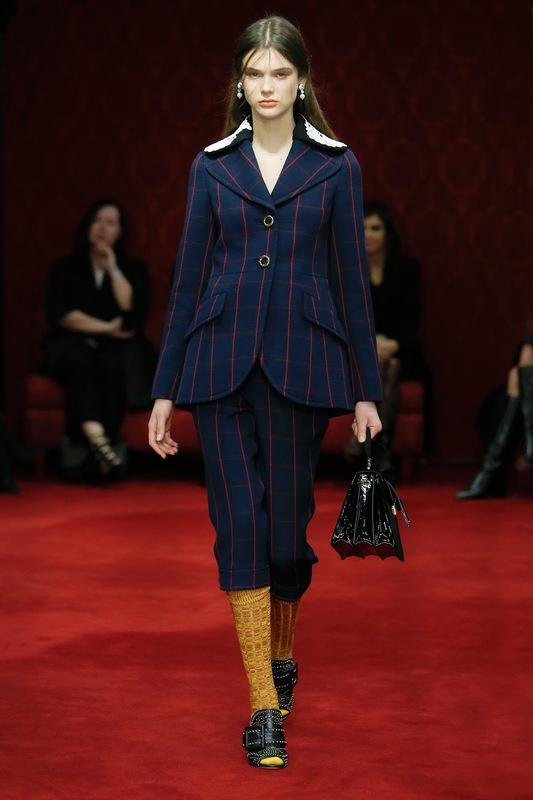 Colourful, flamboyant, suit inspired looks and 70s feels. 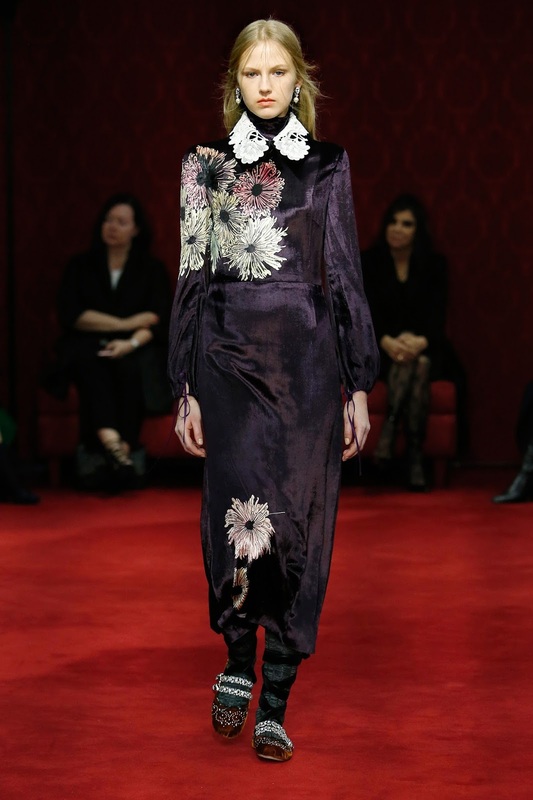 I feel that no other designer nails this just like Miuccia Prada does. She takes things to the next level and isn't scared to take risks and clash prints, colours and pieces. 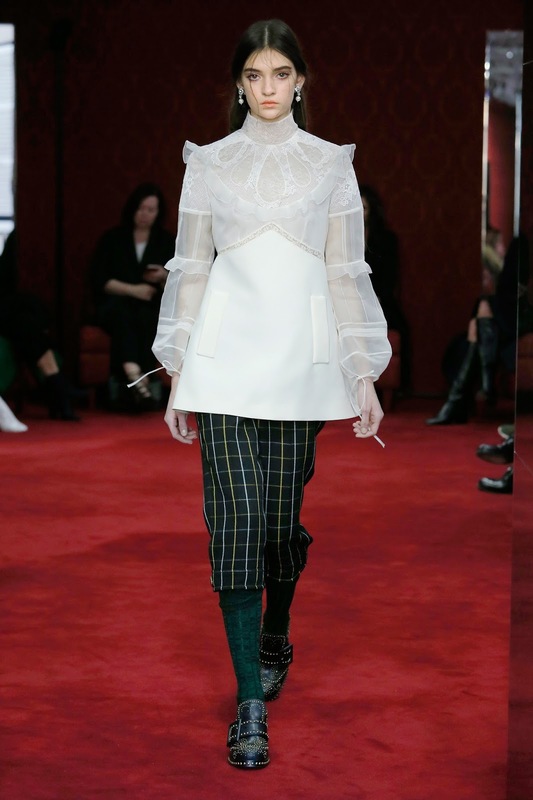 With this particular collection there was a historic feel being injected into the collection with gorgeous white blouses, delicate pear earrings and lace collars played onto slinky jumpsuits. 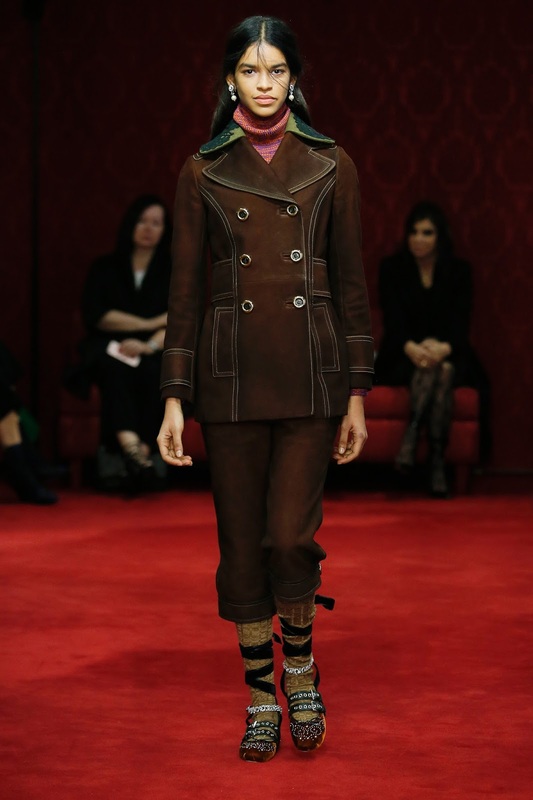 The contrast between this and the 70s retro muse created such a fabulous collection for the clientele for Miu Miu. 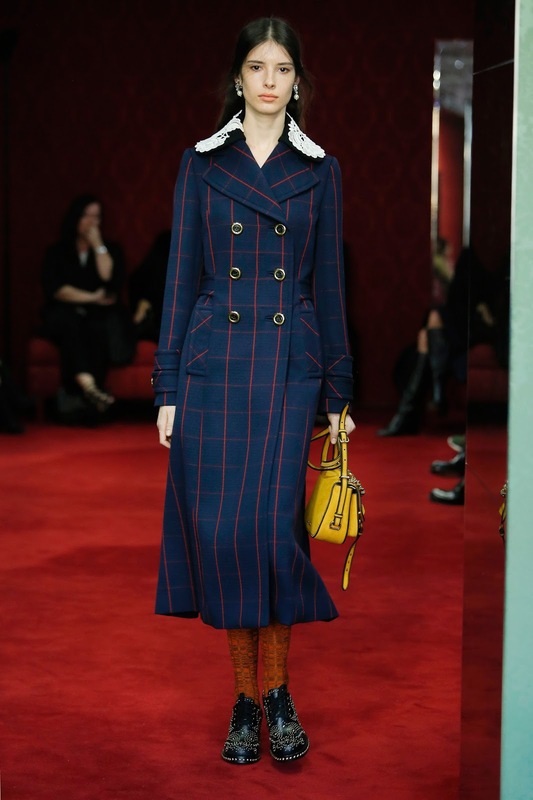 I think that's the inspiring element to Miu Miu, as a fashion house, is is carefree yet incredibly appealing and detailed. 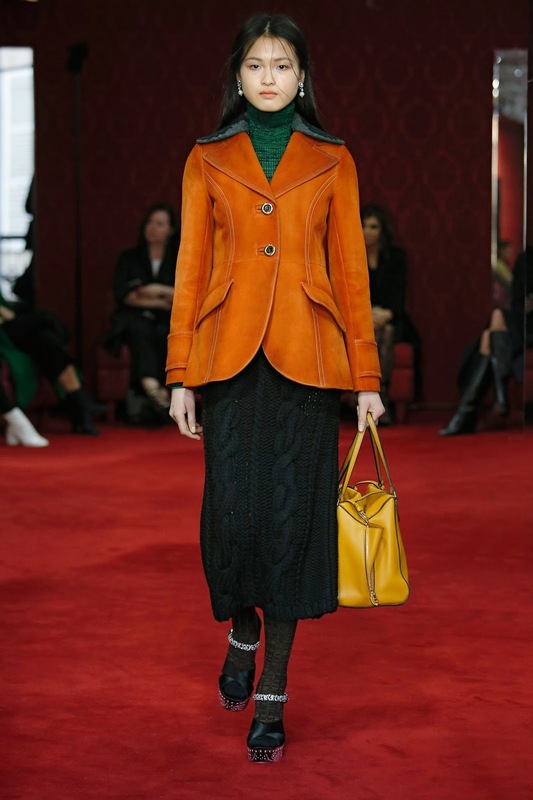 The contrast in colours and pieces was highlighted with layering, which is a great aspect of a collection, espeically for Pre-Fall and Fall/Winter collections. 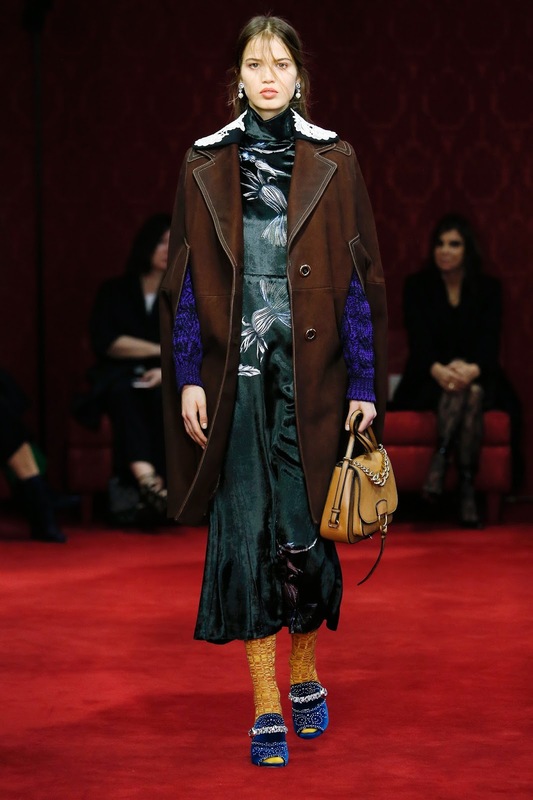 There was a striped blouse placed under a royal purple sweater, teamed with a deep brown oversized coat aswell as a thick red jumper teamed with a silk overlay and a bold purple coat. The contrast in colours is what makes the collection so great. 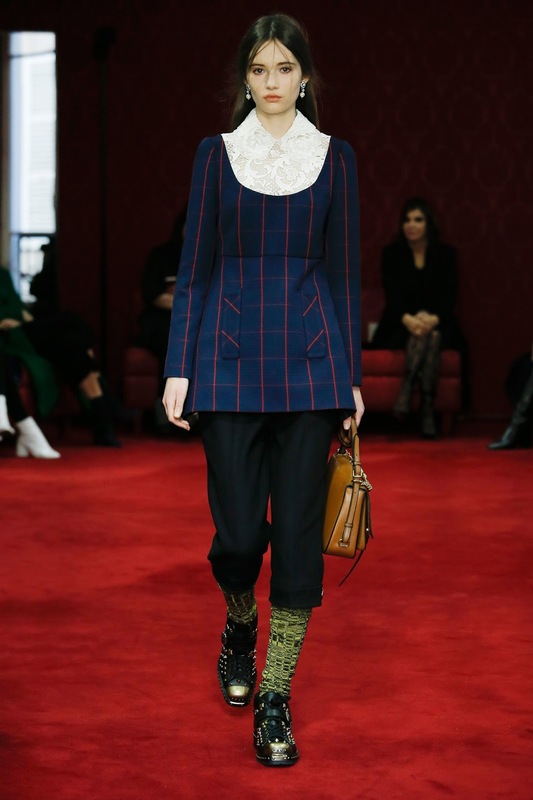 Even though this was a Pre-Fall collection, Miuccia had included knitted shorts - which of course is something I wasn't expecting. 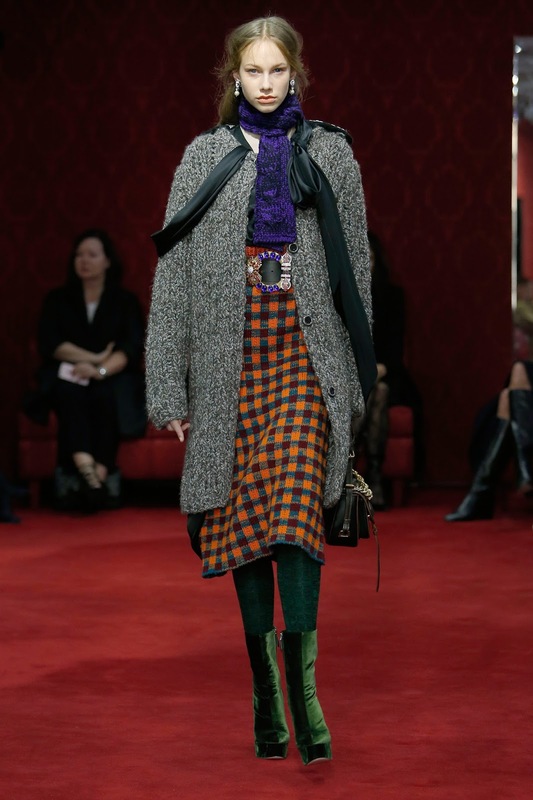 She 'winter-fied' these pieces with knee high socks, chunky brogues and coats which is the perfect autumnal look. She also included beautiful silk jumpsuits which were decorated with floral patterns - giving us that summer feel we do crave in AW. I loved it.